Short term priority initiatives within a five to ten year time frame should focus on the efficient use and re-purposing of existing campus buildings and building space, and continue to enhance the Open Space Framework. The opportunity to create a building presence at the Victoria Avenue corner should also be considered in the short term as a revenue generating facility for the University. This initiative can be undertaken as part of a business partnership arrangement. 18th Street and Victoria Avenue is a prominent intersection that carries a high volume of traffic in Brandon. It therefore presents an opportunity for the University to create a visible mark on the city and reframe its perceived identity. Any new development should function as a main gateway to the campus, and should have the attributes to suit. Opportunities for this parcel of development can include mixed academic facilities, student residences and/or market residential development, the relocation of the Sutherland Gallery of Art, underground parking, and retail at-grade. Uses should generate revenue for the University. Partnership opportunities should be considered to enable the development of the property in the shorter term. Safe pedestrian movement and accessibility along the internal campus streets should be a priority in the short-term. Improvements to Lorne Avenue and 20th Street are opportunities to calm traffic and pedestrianize the public realm. Consider retro-fitting Louise Avenue to integrate the street cross-section recommendations as defined in the Movement Framework, including the integration of the City’s regional bike path, new trees, parking bump-outs, bike parking, and benches. Add pedestrian signalization at the Louise Avenue and 20th Street intersection and install high-quality paving materials at the intersections and key crossing points to help mitigate traffic speeds. Provide signage to better direct and mitigate the flow of moving vehicles, on-street parking, and pedestrian moment along Louise Avenue, giving a priority to pedestrian movement. 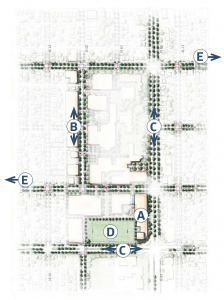 Implement the new street cross-section for 20th Street in accordance with the Movement Framework including: narrowing of the roadway; widening of the sidewalks; adding street furnishings, pedestrian lighting, and signage; and a continued row of street trees and added landscaping. As discussions unfold regarding the pedestrianization of the two major roadways, negotiations with the City to implement streetscape enhancements should be pursued. Encourage the City to implement a Streetscape Master Plan for the street and avenue. The University should maintain and enhance the landscape adjacent to the public right-of-ways with additional tree planting, enhanced paving in the plaza areas, and furnishings such as benches and bike racks that are publicly accessible. Opportunities to enhance the sports field should be considered in the short term. Remove the existing chain link fence and replace with a lower, more attractive and accessible fence surrounding the field. Enhance the field with tree planting, pedestrian pathways and seating around the entire perimeter. Enhance and maintain the turf and quality of the open space as an attractive green varsity field. Opportunities to enhance the connectivity and wayfinding between the Fleming Student Housing site and the BU Downtown site should be explored. Collaborate with the City to implement streetscape enhancements along Princess, Lorne, and Louise Avenues such as street tree planting and sidewalk improvements to create walkable, attractive, and pedestrian friendly circulation routes between the Main Campus, the Downtown Campus, and the Fleming School site. Implement wayfinding signage at the Main Campus and downtown intersections to guide students and users back and forth between properties. Provide a University shuttle service between properties. Collaborate with the City to organize programming and special events along the connecting streets in order to bring an awareness of the wayfinding and connectivity between the downtown and the main campus. Collaborate with the City to implement BU/City of Brandon banners along Princess Avenue to enhance wayfinding and the visible connectivity between the properties. 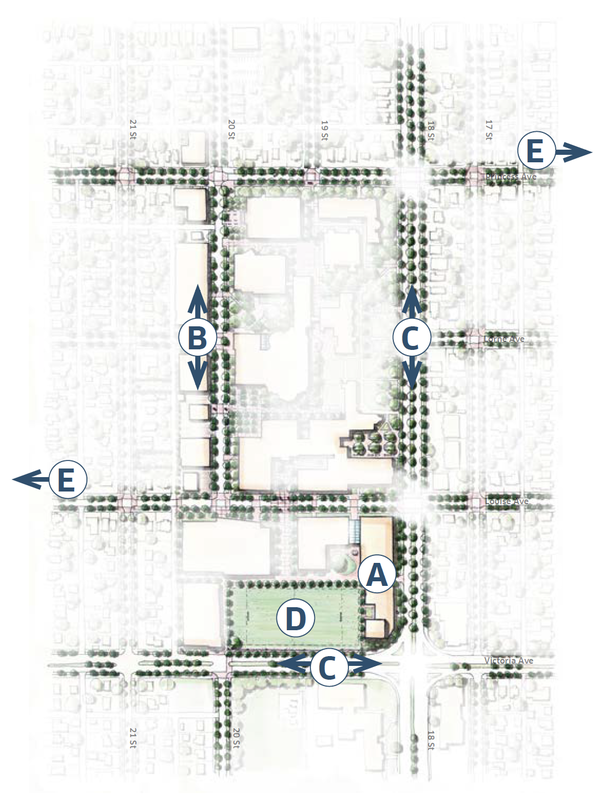 The University should initiate a regular “Jane’s Walk” from the Downtown Property through to the main campus, and on to the Fleming School site to familiarize the community with the University’s land holdings, and to enlighten the community about the Main Campus Master Plan opportunities and the Downtown Plan opportunities. Jane’s Walk is a global movement of free, citizen-led walking tours inspired by Jane Jacobs. The walks get people to tell stories about their communities, explore their cities, and connect with neighbours.